The Space Shuttle Challenger flew her last flight on Jan. 28, 1986; just seconds after take off, killing all seven crewmembers. It was nearly two months before the remains were recovered from the ocean floor, about 18 miles off the shore of Cape Canaveral. 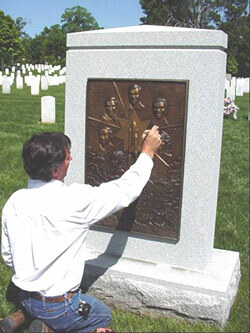 The dedication ceremony was held on the morning of March 21, 1987. Our thoughts and prayers go out to the family members and friends of the crew on the Space Shuttle Columbia. 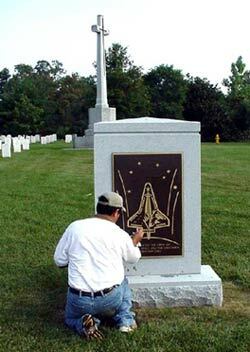 is the Shuttle Challenger Monument. away and allowed moisture and air to penetrate down to the bronze, initiating the corrosion of the surface. Since this was caught when the first signs of oxidation was starting to appear. A light conservation service with minimal intrusion on the bronze was required We start by taking photos of the entire monument and document surface condition before any work commences. The monument is then washed with a mild detergent to remove all pollutions and dirt. When rain comes in contact with the sulfur from automobiles and other pollutants that have settled on a monument it produces an acid that if not removed is destructive to the finish. After the first wash to remove the dirt, a second wash is then performed to remove the remaining old protective wax. one more time with alcohol to remove any contamination from the surface. We then apply a conservation wax to the surface of the bronze. This wax contains an oxidation inhibitor that will help retard the corrosion process. Made by Ron Young of Sculpt Nouveau; we don’t believe there is a better wax for sculptures then this one. They come pigmented allowing us to still produce the artist perception without chemically changing the original composition of the surface. After the first coat is applied and has dried for twenty-four hours a second coat is applied and then hand buffed. able to appreciate them and the soldier and heroes that they honor.